The Cleveland Cavaliers have unveiled their Nike Earned Edition uniform, the newest installment from the Nike/ NBA uniform catalog. The Nike Earned Edition alternate uniform is worn by all 16 NBA teams that qualified or “earned” a trip to last season’s NBA playoffs. The Cavs will debut their own, unique white, powder blue and navy version on Wednesday, January 2nd vs. the Miami Heat at Quicken Loans Arena at 7:00 p.m.
Apart from the color variation, the “Ice” Earned Edition reflects the same design elements of the orange and blue City Edition that was introduced in November. In both uniforms the wave patterns that symbolize Lake Erie, one of Northeast Ohio’s most valuable resources, is integral to the design concept. The cool color palette in the Earned Edition represents the change of seasons as the cold winter that grips Northeast Ohio transforms the Great Lake Erie from water to ice. As with the City Edition, the Cavs teamed up with Destination Cleveland, the area’s destination marketing and management organization, to proudly display the iconic Cleveland script wordmark in navy on the front of the Earned Edition uniform. Framing the wordmark that slants upward across the chest, the famous Nike Swoosh logo is positioned on the upper right chest with the iconic Goodyear Wingfoot logo on the upper left. The neckline is a traditional scoop neck which differs from the modern V-neck on the Association, Icon and Statement uniforms. The player number is positioned to the lower left of the chest in a navy font. The back of the jersey features the player name and number in a navy font, and a small square patch on the back-center collar that displays the number “1” is positioned inside of the Larry O’Brien trophy to represent the Cavaliers NBA Championship in 2016. This is a standard feature on the uniforms of all teams that have won an NBA Championship. The jock tag on the lower left front of the jersey reads “1 OUT OF 5 GREATS,” in reference that Lake Erie is one of the five Great Lakes. The shorts feature the letters CLE at the center of the waistband, the popular abbreviation taken from the Cleveland script wordmark. 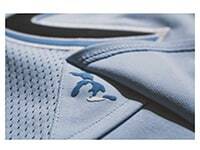 The Cavaliers “C” logo, in navy and outlined in powder blue and white to create a three-dimensional appearance, is prominently featured on the right leg, and under the ventilation flap is an icon of the Great Lakes. An outline of the wave on the left leg of the shorts provides another splash of color separation between the powder blue and light blue colors. Available Beginning Wednesday December 19 at 10:00 a.m. The Cavaliers 2018-19 Earned Edition Collection features men’s and youth jerseys (with Goodyear Wingfoot patch), hoodies, tees and hats. The new collection will be available for purchase beginning Wednesday, December 19th at 10:00 a.m. at the Cavaliers Team Shop at Quicken Loans Arena and online at Cavs.com/shop. Special Gift with Purchase! Fans that purchase an Earned Edition jersey Wednesday, December 19th through Saturday, December 22nd (in-store and online) will receive a free Cleveland script desk sign while supplies last. 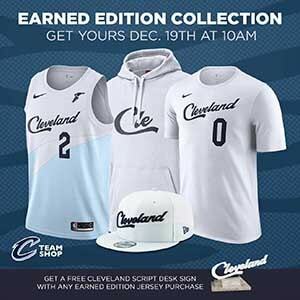 To receive a notification reminder of when the Earn Edition Collection is available for purchase, sign up at https://www.cavaliersteamshop.com/jersey-restock-notification-signup.